Sandra Allen did not know their uncle Bob very well. As a child, Sandy had been told Bob was “crazy,” that he had spent time in mental hospitals while growing up in Berkeley in the 60s and 70s. But Bob had lived a hermetic life in a remote part of California for longer than Sandy had been alive, and what little Sandy knew of him came from rare family reunions or odd, infrequent phone calls. Then in 2009 Bob mailed Sandy his autobiography. Typewritten in all caps, a stream of error-riddled sentences more than sixty, single-spaced pages, the often-incomprehensible manuscript proclaimed to be a “true story” about being “labeled a psychotic paranoid schizophrenic,” and arrived with a plea to help him get his story out to the world. “Searing” (O, The Oprah Magazine), “enthralling” (Star-Tribune, Minneapolis), and “a marvel” (Esquire), A Kind of Mirraculas Paradise shows how Sandy translated Bob’s autobiography, artfully creating a gripping coming-of-age story while sticking faithfully to the facts as he shared them. Sandy also shares background information about their family, the culturally explosive time and place of their uncle’s formative years, and the vitally important questions surrounding schizophrenia and mental healthcare in America more broadly. The result is a heartbreaking and sometimes hilarious portrait of a young man striving for stability in his life as well as his mind, and an utterly unique lens into an experience that, to most people, remains unimaginable. 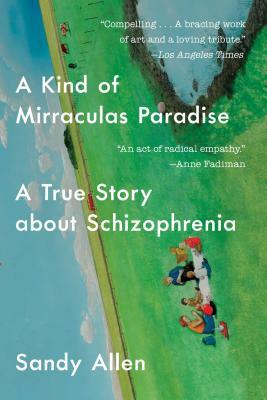 “Thrilling…Gorgeous…a watershed in empathetic adaptation of ‘outsider’ autobiography” (The New Republic), A Kind of Mirraculas Paradise is a dazzlingly, daringly written book that’s poised to change conversation about schizophrenia and mental illness generally. "Compelling... A bracing work of art and a loving tribute to a man whose voice, no matter how unpolished, deserves to be heard." "This book is an act of radical empathy through which the author--and, vicariously, the reader--enters intimately into a life that would otherwise be unintelligible." "A breakthrough in meta-biographical writing... [Allen] marries several distinct genres to produce an insight into what it means to be a person with a psychiatric diagnosis...Thrilling... Gorgeous... a watershed in empathetic adaptation of 'outsider' autobiography." "Enthralling... Being inside [Bob's] head, seeing how life felt and looked to him, is a miraculous thing indeed." "Sandra Allen has crafted a fearless narrative about what it is really like to grow up under the weight of mental illness . . . Honest, heartbreaking, and often humorous, this remarkable book offers a window into an experience of mental illness that many people often never get the chance to see through." "Intriguing... mesmerizing... what a journey it is." "Insightful... Allen offers readers an incredible glimpse into the life of a person battling with schizophrenia." “A book of many strange and often oddly beautiful pieces that together combine into a story that will make you tremble. A Kind of Miraculous Paradise is a resurrection of sorts, a profound retrieval of a life from beyond the veil with which so many of us obscure the realities of illness and family, loneliness and intimacy." "Righteous, empathetic... [Paranoia] is seldom experienced or portrayed so elegantly as Allen does here." "Compelling... skillful... vivid... a page-turning biography and family history... a deeply personal story about an enigmatic person living the only way he knows how: by trial and error."